FTTC fibre broadband (e.g. BT Infinity) still makes use of copper wires between you and the street cabinet. While a new technology called VDSL2 is used to carry the broadband signals over the copper wires (which can deliver much faster rates than ADSL2+ and ADSL), speeds do drop off the further you are located from the fibre street cabinet. Furthermore, VDSL2 connections can be severely affected by crosstalk interference if the take-up of fibre broadband is high to your fibre street cabinet, which could result in lower speeds than those estimated here. Currently, BT is currently trialling a technical solution called 'vectoring' to address crosstalk, although BT has not yet committed to nationwide roll-out. What download speed can I expect from fibre broadband? The chart above shows the expected speed of BT's FTTC service for different distances from the street cabinet for a clean connection. Broadband users within about 300 m of the street cabinet can expect to achieve about the maximum possible downlink connection speed (currently 80 Mbps). Speeds fall to about 60 Mbps when 500 m away from the street cabinet and, at 1 km, about 28 Mbps connection speed can be achieved. We believe that these figures are quite conservative for a good line where fibre broadband take-up is low so you may be able to achieve higher speeds, although the maximum connection speed is currently capped at 80 Mbps. 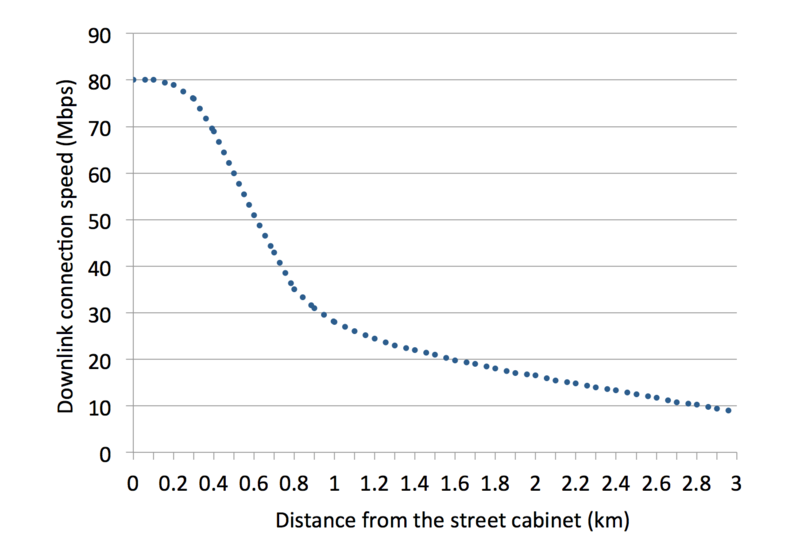 The table below shows the relationship between estimated downlink connection speed for FTTC fibre broadband and the distance from the BT (green) street cabinet. For a good line and where the take-up of fibre broadband is relatively low, we believe that these estimates are conservative so you may be able to achieve higher speeds (up to the maximum of 80 Mbps). If FTTC is available in your area, this will be indicated on the BT's Broadband Availability Checker. Because of the higher frequencies used, broadband signals are susceptible to a particular type of interference – known as ‘crosstalk’ – from other VDSL2 broadband signals being carried along adjacent pairs. Sadly, BT and other ISPs have been relatively quiet about an issue that can result in significant declines in broadband speeds as the penetration of fibre broadband increases. What is particularly frustrating about crosstalk is the fact that it is essentially impossible to predict the extent to which a particular broadband user will suffer degraded performance. This is because the level of crosstalk interference depends on the position of the pairs carrying VDSL2 signals with respect to one another. So, one broadband user could experience significant degradation whereas another could be unaffected. This makes accurate predictions of broadband speeds impossible. To provide flexibility for telecoms operators worldwide, a number of so-called VDSL2 profiles have been defined, which differ in the width of the frequency band used to transmit the broadband signal. Profile examples are shown in the table, below. Profiles that use a wider frequency band can deliver higher maximum speeds. Operators can choose to cap the maximum speed. When BT first launched its first FTTC fibre broadband service, profile 8a was adopted and BT capped the maximum download connection rate at 40 Mbps. In April 2012, BT implemented the 17a profile (using more than twice the original bandwidth) and capped the maximum download connection speed to 80 Mbps. This is currently the highest speed offered. In the future, there are likely to be further speed improvements made to BT's FTTC service. Firstly, adoption of the 30a VDSL2 profile (using a wide 30 MHz bandwidth) could deliver maximum speeds well above 100 Mbps, although this would mainly benefit premises located close to the street cabinet. We believe that BT may choose not to implement the wider profile. Secondly, an advanced technology called 'VDSL2 vectoring' is likely to be applied, which is a noise cancellation technology designed to reduce crosstalk interference on copper cables (where broadband signals carried on neighbouring copper lines interfere with each other). FTTC will never match the performance obtained by FTTP due to the limitations of copper cables. However, for many consumers, FTTC will adequately (and cost effectively) deliver the speeds and reliability required if they are located relatively close to their fibre street cabinet. Business users desiring greater speeds and improved resilience (or consumers living a significant distance from their fibre street cabinet) have the option of bonding two (or more) FTTC connections together.